Ever since those first squeaky notes came out of the school recorder, I was aware that my three-times great-grandfather's flute lay on a shelf in my grandparents' home. I lost no time in experimenting with it and was delighted to discover that I was the only one in my family who could coax a musical sound out of it. Years passed, a teenage infatuation with the guitar interposed, I grew out of that and I finally returned to the flute through my interest in traditional music. What I was unaware of until I helped to clear out my grandparents' house in 2000 was that the accompanying tune book to the flute had been resting in a drawer in that same house for 50 years. 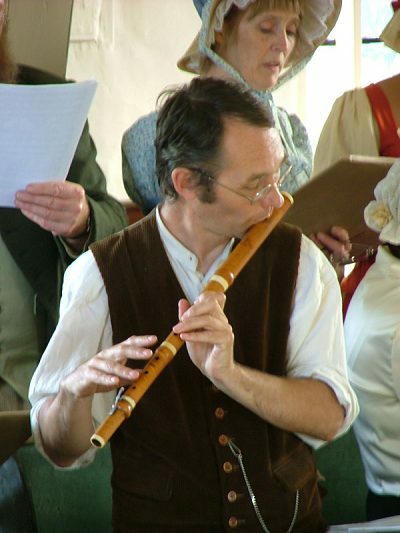 I now divide my musical efforts equally between my ancestor's flute music and the East Anglian dulcimer. East Anglia has been the home of the dulcimer (I hate the term "hammered" dulcimer) for as far back as anyone can remember and research is pushing the earliest records here further back in time even as I write. I bought my London-made 1885 Ihlee and Sankey instrument in 1986, the year in which the great virtuoso, Billy Bennington, died. Indeed, it was listening to him that led me to look for one in the first place. I have learnt to play in the traditional style, my main influences being Billy Bennington, Billy Cooper and Reg Reeder. 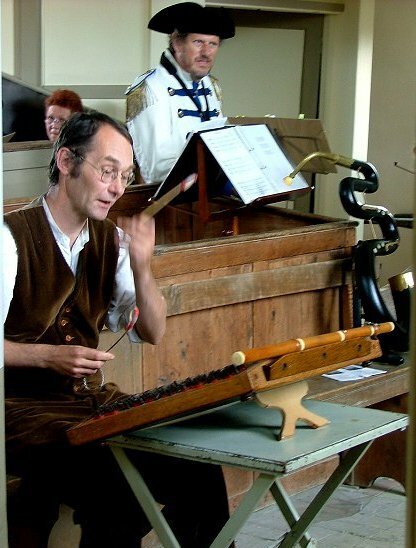 I now find myself among a very small number who still use the traditional tuning, which I consider to be one of the most versatile dulcimer tunings in the world. It allows chordal and harmonic accompaniment in the home key of G and its close relatives. It also facilitates playing in the keys of c,d,f,a and bflat with very little trouble, not to mention the relative minor keys and modes. With 21 bridges it has a range of three octaves. There are not many other small tabletop dulcimers in the world that can boast all this. I perform with the folk bands, Rig-A-Jig-Jig and The Fall of Eve, and with the latter, I accompany the Norfolk Gallery Quire. I have also recently joined the King's Lynn Waites, a re-creation of the Renaissance town band of King's Lynn, with whom I play bagpipes, rauschfife, shawms, curtal and recorders.